The tire was shot. I was going nowhere and this was not a safe neighborhood. Thankfully, a pitiful appearance is one of my most useful attributes. Time for a nice, easy, relaxing peaceful day….good thing my plans always work out. 🙂 The main reason that I had come to Cali, Colombia was that my next song place, Padilla (58 of 92), was in striking distance. Visiting this little community would make for a nice day trip. Perhaps I should give a little bit of explanation why this was going to be my Padilla. I’ve maybe mentioned before that the selection of places was one of the first steps in the process of planning this trip. Doing so was essential for obtaining my initial rough calculation of mileage. This means that over three years have passed since I made most of these decisions. 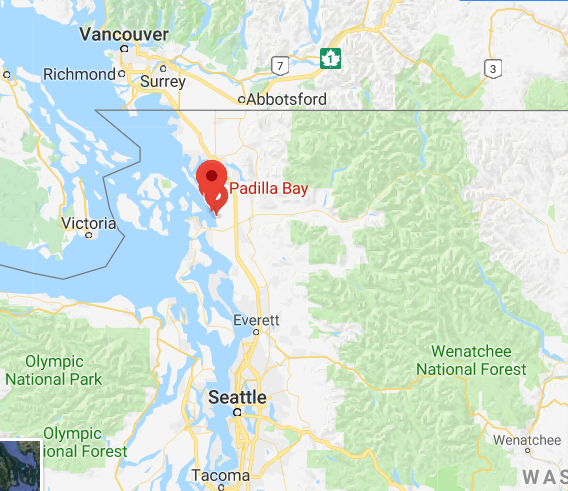 The other “Padilla” that warranted strong consideration was the bay in Washington which goes by the same name. I had driven right by it on my birthday, about nine months ago. Given that Padilla is a fairly common surname in Latin America, I was a bit surprised that there was not a more populous option. But I’ve always loved that the song features a true mixture of places, so I was glad to get a chance to see what this community of 8,000 people had to offer. Though I was only about an hour away, I had yet to find anyone who had actually heard of Padilla. I picked my way through the dense city traffic in Cali before finally finding the open road. It almost felt strange be riding on a road that was dead straight. Oceans of sugar cane fields surrounded me. 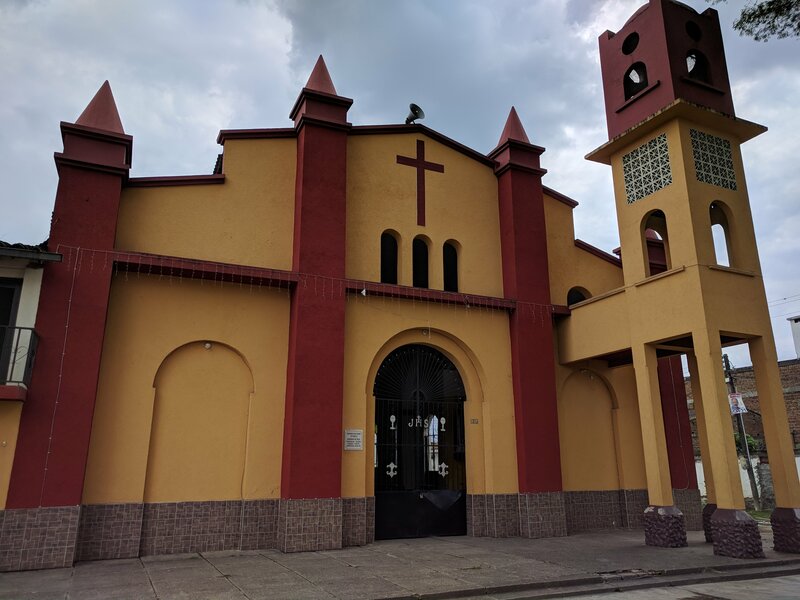 I made it to the city of Puerto Tejada and almost immediately felt uneasy. I can’t completely quantify why I felt this way, but it was perhaps the least safe that I had felt during my whole time in Colombia. The infrastructure was crumbling, the poverty of the inhabitants was painfully clear and people looked at me as if I were from another planet. A couple of times, I disobeyed my navigation as the indicated street looked too risky. I made it through the city and told myself that I would investigate an alternate route on my way back to Cali. 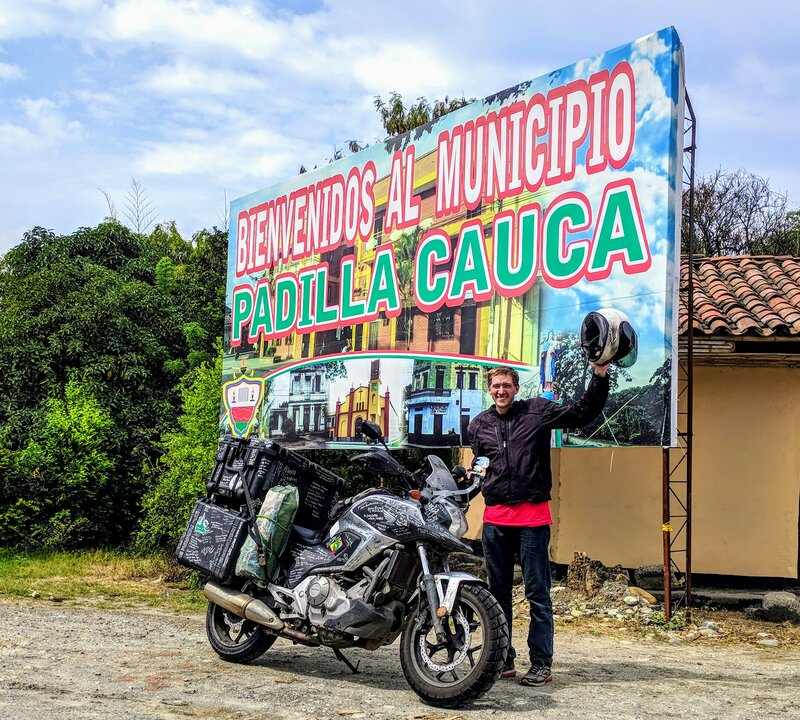 Less than a mile outside of Puerto Tejada, I reached a strangely complicated intersection which put me on the road to Padilla. Then I felt it: A shimmy most subtle. Anytime I feel something strange while I’m riding, I always pull over and take a look. Though I wasn’t too suspicious in this instance, I knew that I was somewhere that I did not want to be stranded. I swung my foot lightly at the rear tire. Pitifully, it offered no resistance. Over 32,000 miles in, I had my first flat of the trip. A wave of fear crashed into me, the likes of which I hadn’t felt since I had the bear outside of my tent in Idaho. I did not feel safe in this area and now I was most likely going to be stranded there. My mind immediately began to wonder through all of the unfortunate possibilities for Annie and for myself. I was praying silently and cursing audibly. Perhaps I should have switched these around. I did have a moment of clarity when I decided to message my parents and tell them what was going on. Furthermore, I told them I would text them every 15 minutes to ensure that I was safe. 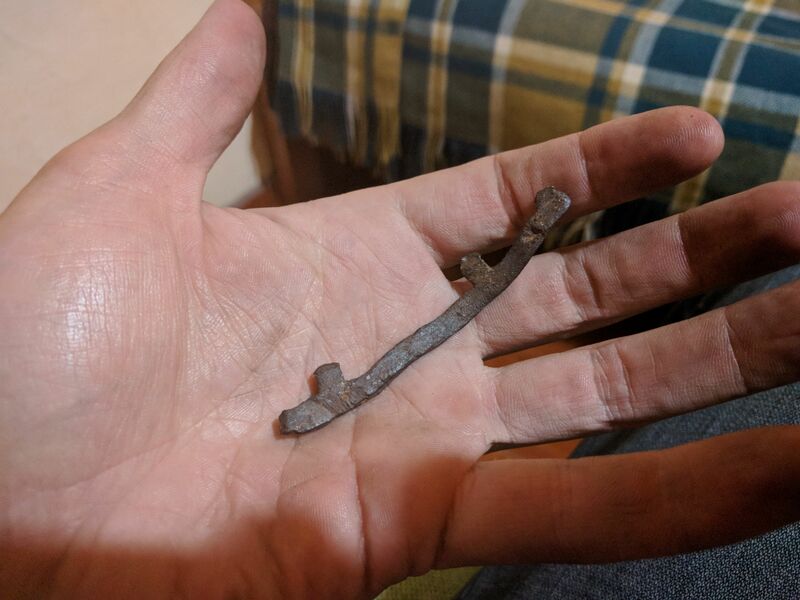 I was able to find the source of the puncture very easily. What happened next made me feel like I was at a magic show. But instead of a magician pulling an endless array of scarves, it was me yanking out a seemingly endless piece of metal. Seriously though, how did this get all the way in there? I did still try using a plug, but it was obviously an act of desperation. This was almost more of a rip than a puncture. I had no idea what to do next. I sat down next to Annie’s wounded wheel and tried to think through my options. Vehicles passed occasionally and there was a small row of houses near. An elderly gentleman was hacking away with a machete in the adjacent sugar cane field, but he paid me no attention. I was so deep in thought that I didn’t hear someone approaching from Annie’s bow. When I stood up, he seemed a little surprised to see me too. In this sort of situation, it’s a natural reaction for me to size up the attributes of a stranger. This guy had me beaten in height, reach, youth and build. This was how I met Ricardo. 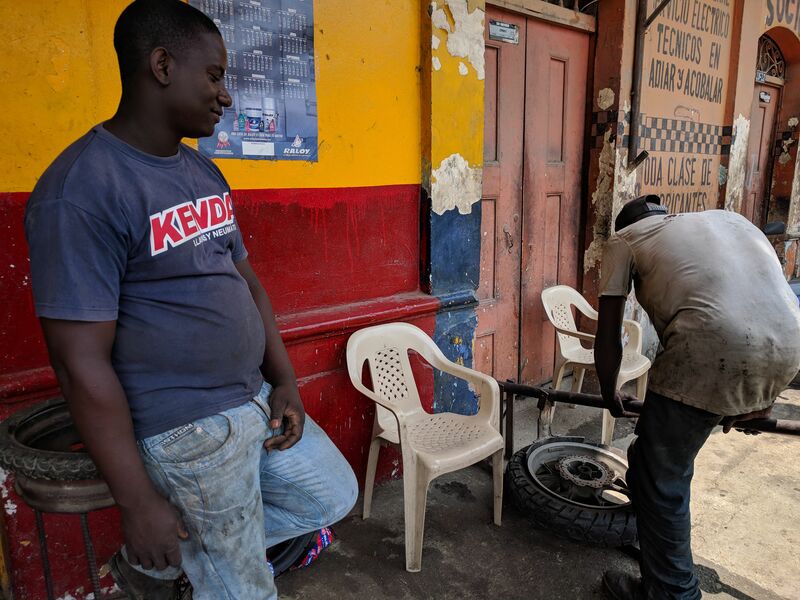 I told him what happened and asked about the closest place where I could get a tire changed. 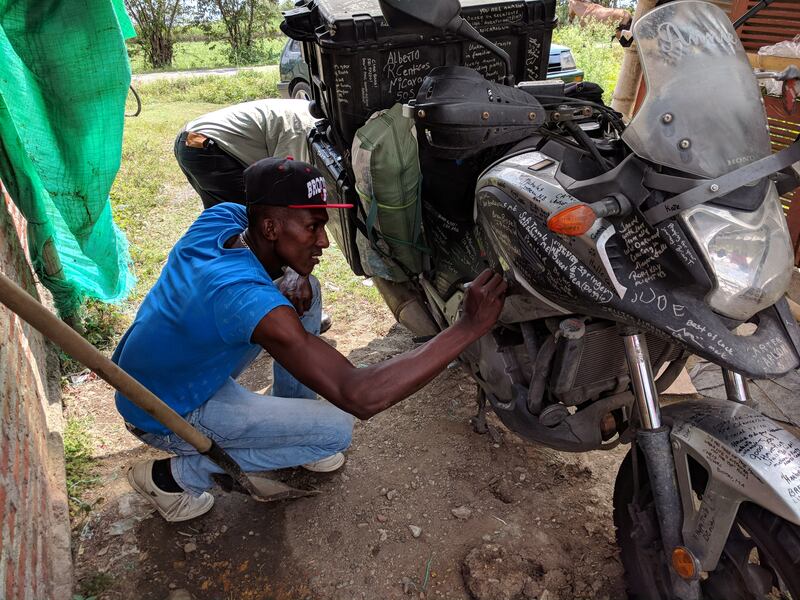 Almost immediately, he offered to let me leave Annie at his place and drive me back to Puerto Tejada. He lived in the house closest to where I had stopped, probably just 50 meters or so. Though I still didn’t trust him completely, I wasn’t sure what other options I had. He helped me push Annie beneath a tarped area alongside his abode. It was nice to be out of the sun as I labored to get the wheel removed. After I got the wheel off, I made sort of a cheeky maneuver. I told Ricardo that my Mom was really worried about me and that it would help her feel better if I sent her a picture of the guy who was helping me. This wasn’t exactly true, but I thought it would provide me with some insurance in case he would be thinking of doing something less than kind. 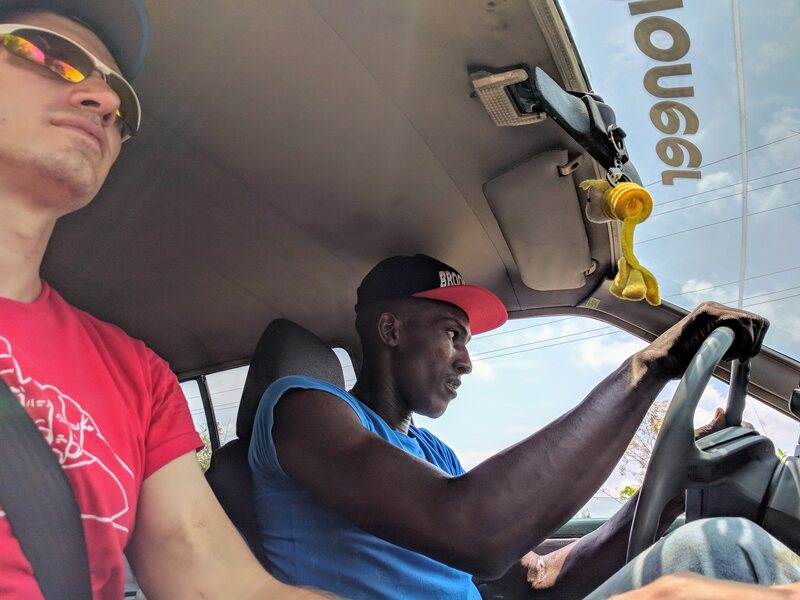 Ricardo shoe-laced the wheel to the top of his car and we headed back into Puerto Tejada, the town that I had been wanting to avoid. When I asked him about the city he didn’t sugar-coat his response, saying that it is a dangerous place especially, for outsiders. 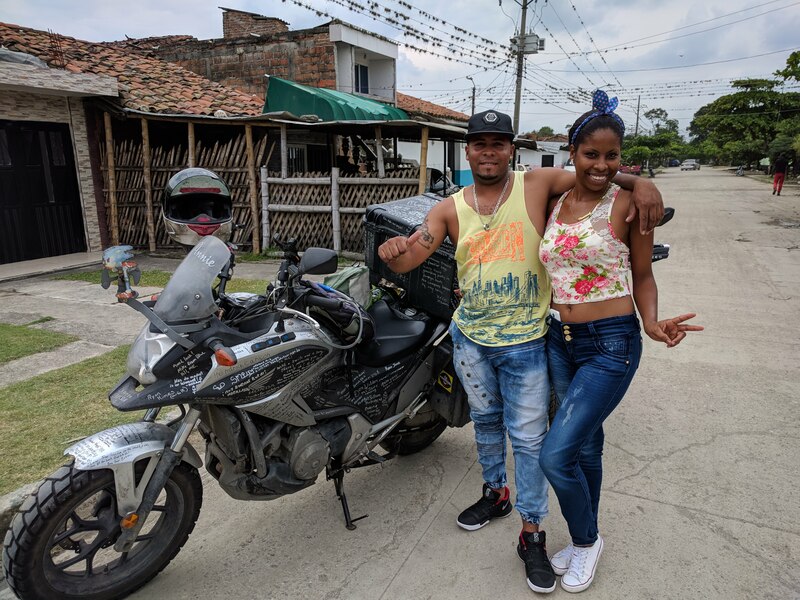 Additionally, the city is almost exclusively populated with dark-complected Colombians, so I stuck out even more than usual. 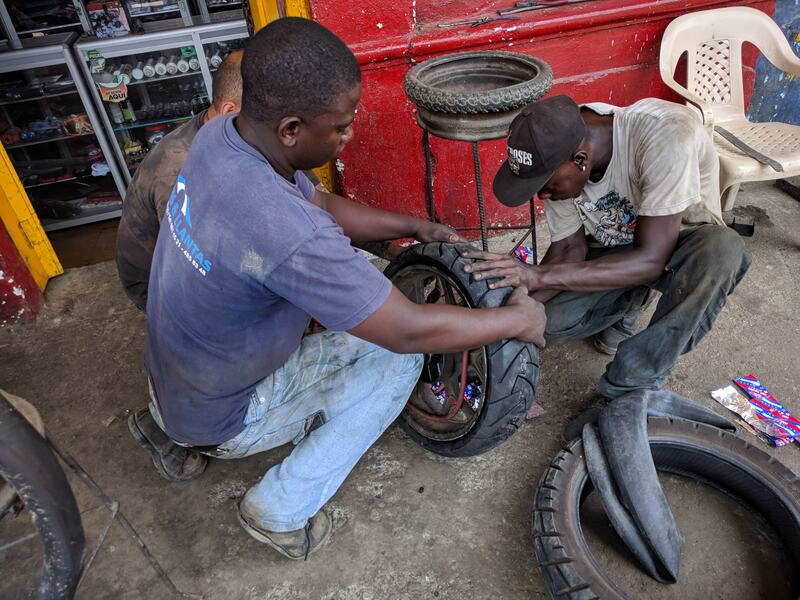 At the “llanteria” (tire shop), I had quite a task in front of me: Explaining my tire situation. My Spanish level is at such a strange stage. Oftentimes, I cannot comprehend the simplest conversations. But I’ve noticed that when I really need to communicate something, my lingual adrenaline kicks in. 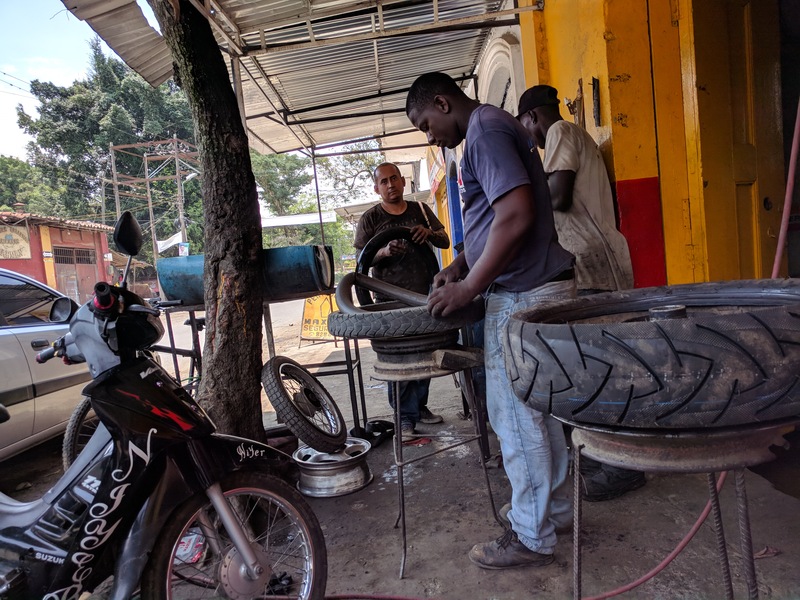 I was able to explain to them that I had done some damage to the rim on the last tire change, so I was running a tube inside of a tubeless tire. I asked for their opinion as to whether I needed to continue using a tube. 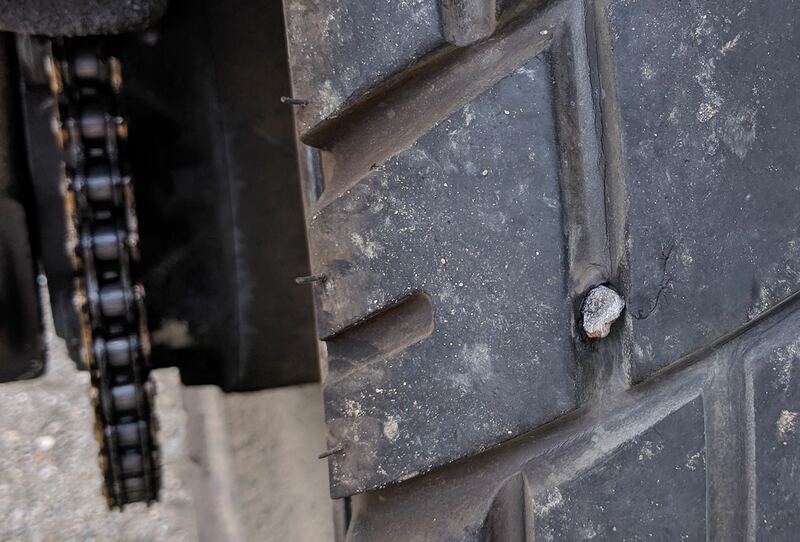 I also told them that my current tire was getting close to the end of its life, so I would take a new one if they had it. 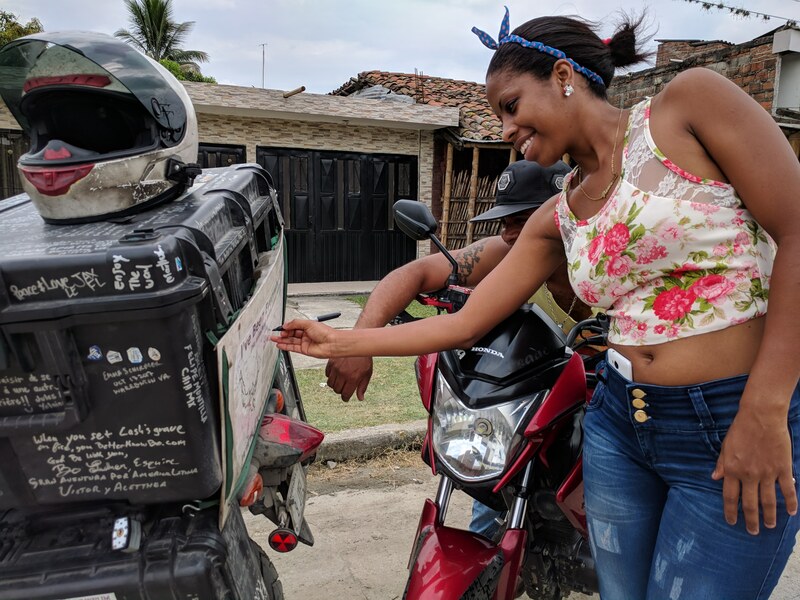 There were some differences in vernacular, of course, most notably that they referred to the tube as “la tripa” rather than “la camara” or “el tube” which I had heard before. 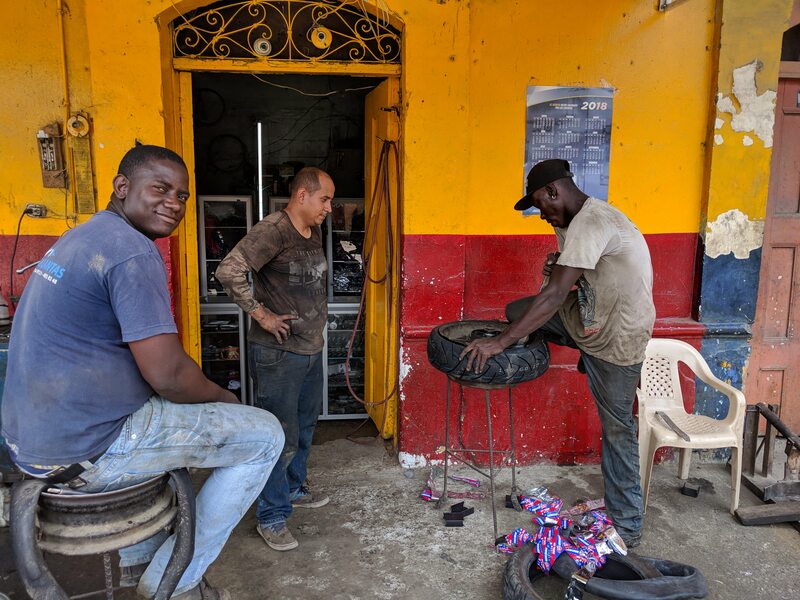 I walked with the guy who appeared to be the owner, Luis, to the next block where he stores his tires (and has a little helper). At first glance I didn’t think that the tire would fit, but he assured me that it would be fine. He was super accommodating, even attempting (and mostly succeeding) to tell me the price of the tire in English. It seemed as if he really wanted to be up front with me. Watching the shop in full, mid-day operation was quite a sight. 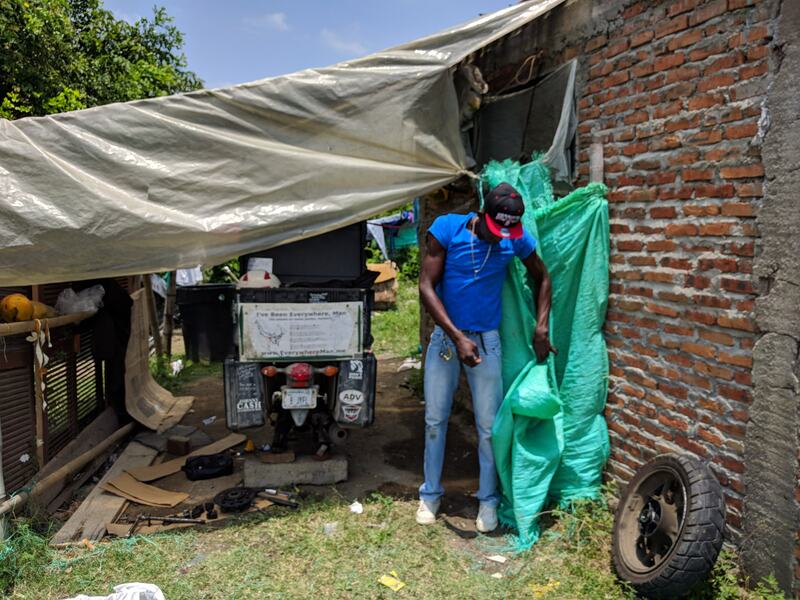 It did not matter what rolled up – motorcycles, scooters, trucks, bicycle carts – they would have the wheel off, on and repaired in no time. 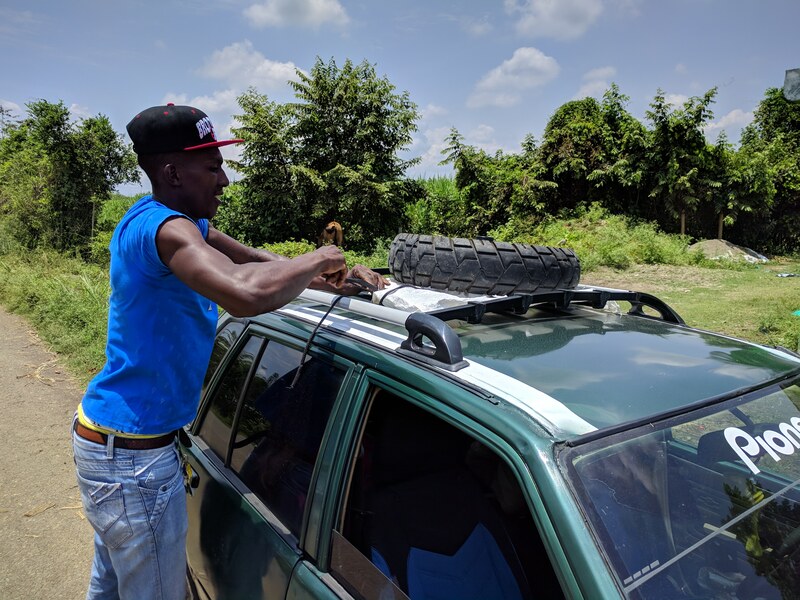 They seemed to be prioritizing “working vehicles” over my repair, for which they apologized; but my fear had fully subsided and I was to the point where I was actually beginning to enjoy myself. When it came time to set the bead on my tire, they did have some troubles. Even with all three of them bouncing, pounding and squeezing; they could not get it to set. They came up with a very “Latin Americanesque” solution. They used a tube to set the bead, then just snipped off the valve stem and left it inside. I was thoroughly confused by this process. I asked them if they thought it was better for me to run with a tube, but they said “no” as they were putting the tube inside. I didn’t understand it until it was all done. I put 180,000 down on the counter and told him that I didn’t need change. He looked at me with a surprising amount of disbelief and asked, “En serio?” (Are you serious?) I tried to explain to him what his help meant to me. I got to the point of telling him how much fear I felt right when the flat happened. Suddenly, I had a lump in my throat and water began to well in my eyes. 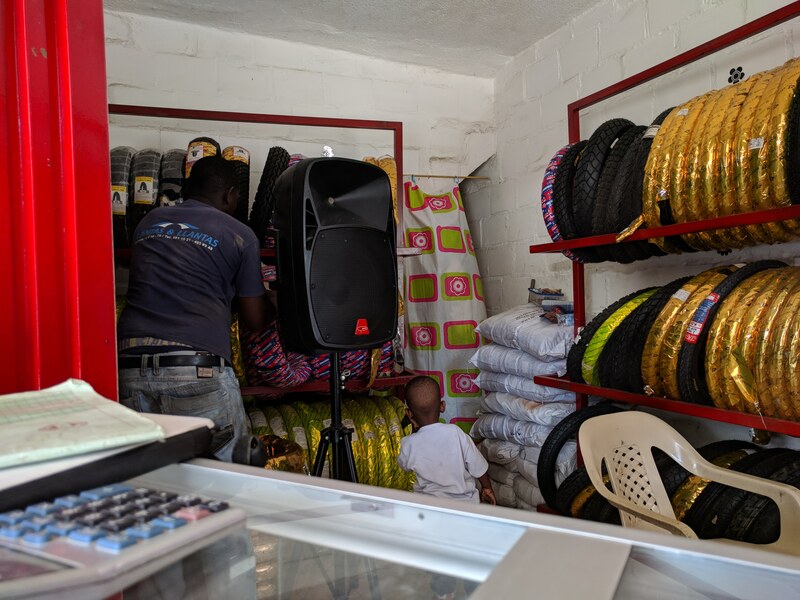 (…but I’m sure they have crying gringos in this tire shop pretty much every day….no big deal) He shook my hand multiple times and treated me to a glowing smile. It alone was worth the paltry $3 tip. Ricardo shoe-laced the wheel back onto his car and we drove back to his place (10 min. or so). I couldn’t believe this guy’s generosity. Here he was taking about two and a half hours (by the time I got the wheel back on) out of his day, just to shuttle around this strange Nebraskan who had been stranded on his doorstep. Even though we were together for quite awhile, I didn’t get to know him as well as I would like. I wasn’t quite able to understand what he did for a living. He dug up some kind of material from the nearby river (like a plaster or cement) that was used on buildings. My profuse “gracias’s” didn’t seem sufficient to let Ricardo know how much I appreciated his actions. Before we parted, I pulled out the remainder of bills in my wallet and handed them over to him. (This was actually a bit of a rash decision since I was now in the Colombian countryside with no money. )His reaction was interesting. He didn’t seem overly surprised, nor did he try to refuse the gift. I hope this means that it could be useful to him. He signed Annie a little differently than most, leaving his phone number. He let me know that I was welcome to seek his help again if I should need. I rolled away from Ricardo’s place very gingerly. Any change to the set up of a motorcycle makes an impact on the handling. The curves were a little uneasy as I got used to it and the smaller diameter now meant that I had about a 4% error in my speedometer. Still, I felt nothing but immense gratitude for the new piece of rubber propelling me along. Try as I might, I just couldn’t imagine a more smooth resolution to my intimidating situation. My destination, Padilla, was less than 15 minutes away. The town is small enough that I really didn’t know what I was looking for. The town sign was great though, which made for a logical first stop. I didn’t feel too at ease in this place. 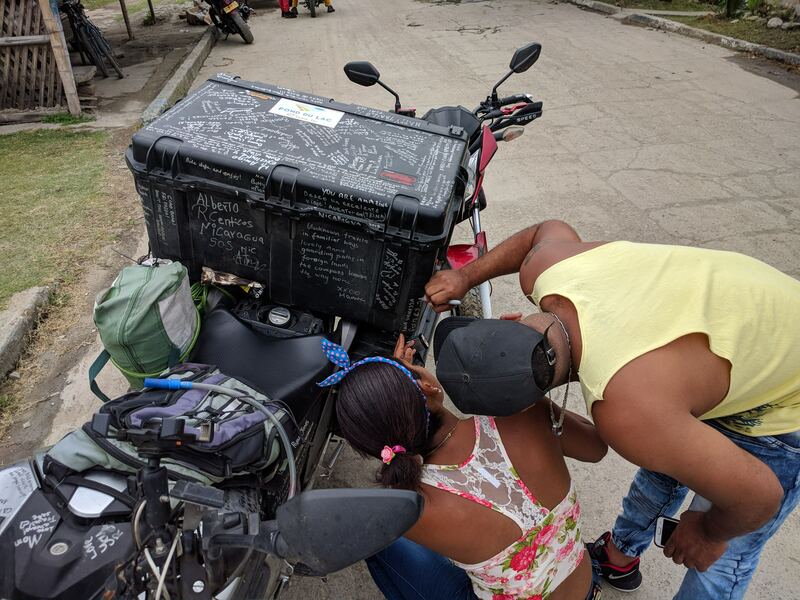 Similar to Puerto Tejada, the infrastructure was in a state of disrepair and I really stuck out. Still, I was determined to at lease drive around the majority of the town and see what I could see. I received an especially curious glance from a guy on a Honda CB110 who was riding with his significant other. He somehow anticipated my next meandering turns and met me head on one block further south. He flashed his headlight at me. Though I did still feel a bit uncomfortable, I decided to stop. This is how I met my new friends Ferney and Vanessa. …and add to my mechanical guestbook. I had fun chatting with them and they had lots of questions for me. Towards the end of our conversation, Ferney’s tone changed noticeably. He told me that he was worried about me getting robbed and that it would be best for me to leave Padilla soon. He also warned me not to trust anybody that I met. After each of these statements, he followed with, “Tu me entiendes?” (Do you understand me?) He knew my Spanish was limited and wanted to make sure he was getting his point across. What wonderful, caring (and one must admit, photogenic) people. I took their advice and left Padilla pretty soon after our conversation. I would have liked to grab some local food, but I didn’t have any money. I did see them talking with someone on my way out of town and was able to give them a goodbye wave. On the ride back to Cali, I got drenched in rain. Returning to my hostel felt like breaking the tape at the end of a race. What was supposed to be a simple, run of the mill day, turned into much more of an adventure. 58 down, 34 to go. I’ve heard the platitude many times, which goes something like this: “People are essentially good.” As much as I want this sentiment to be true, I can’t say that I agree with it. What I do believe is that people are constantly presented with complicated situations in which they have the freedom to choose their response. On this day, many people were presented with the opportunity to take advantage of me and my situation. Unanimously, they chose to respond with pity, mercy and kindness. I truly hope that these are lessons which will continue to affect me. Realtime update: Hoooooo boy! I’ve had really poor internet for five or so days, so I am way behind now. I’m currently in Cusco, Peru with my old family, while Annie is residing with my new family in Cayambe, Ecuador. 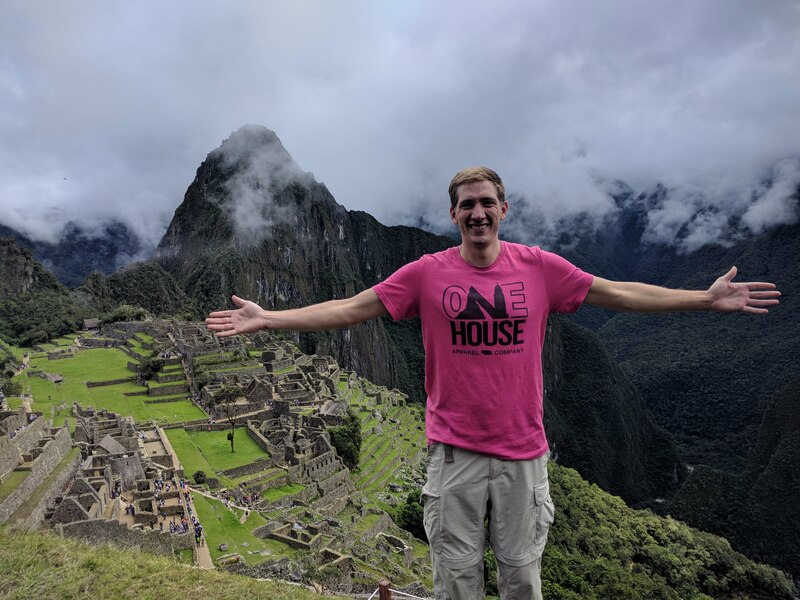 Yesterday we got to visit Machu Picchu, which was truly a lifetime experience. Ok, fine…I’ll share one picture. It is very obvious that GOD is with you every day. Carole R.
Thank you for that. Sometimes the troubles help us realize the source of our help. I’m trying to be thankful for the bad days as well as the good. 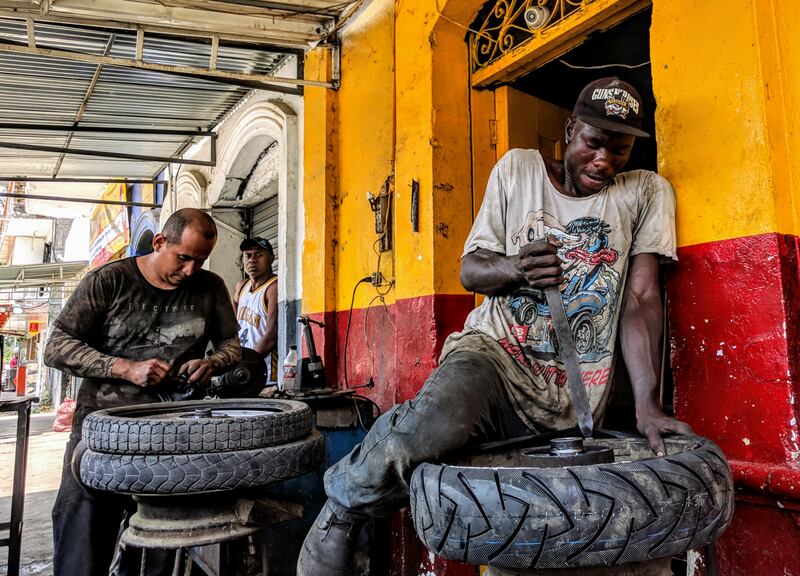 I love the photo at the top of the tire shop guys. Doing their job. And Ricardo! A gift to you (and vice versa). This story says so much about the meeting of two worlds. Your experience here could be a textbook example in a course on global economics or sociology. Or philosophy or theology! What made me smile the most was Ferney’s surprise that you weren’t lost, but rather right where you intended to be. This WAS your Padilla! That does make a person shake their head a little. As my brother once said, there are no coincidences. And how fantastic that your family has joined up with you at this juncture! Yeah, the blessings are innumerable in this story. I just can’t imagine it going any better. I feel so thankful! It’s about $15 per tire. Seriously, get some stateside. If you don’t, I’ll just put some in your tires while you are sleeping. Love, bro. Ha! I used a similar product in Texas, but I don’t know if it was meant for tubed tires. Either way, I don’t think anything would have stopped air loss with this puncture. That thing is huge!